Unlike injuries in the peripheral nervous system, those in the spinal cord often result in the emergence of a severely degenerative local environment, leading to further tissue damage in the months following the initial insult. Although much work has been done to identify the causes of this degenerative environment, there has been relatively little success in achieving regeneration after a spinal cord injury. We are investigating the idea that a pro-regenerative implant may be able to reverse the trend of post-injury tissue damage in the spinal cord. 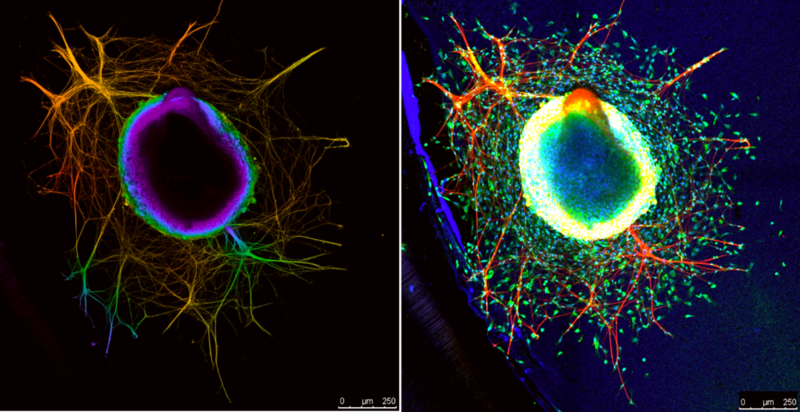 Two different visualizations of the same piece of neural tissue. Above: a piece of neural tissue growing out into an engineered hydrogel. The tissue begins as a sphere the size of a grain of sand. Over time, neurites project out into the surrounding hydrogel, forming a network. By studying the type of regenerative growth in response to the hydrogel's biochemical and mechanical properties, we better understand how to stimulate and control regeneration of injured nerves.